Esteban Santiago, the man who killed five people in the January 2017 shooting at Fort Lauderdale-Hollywood International Airport, will be spending the rest of his life behind bars. 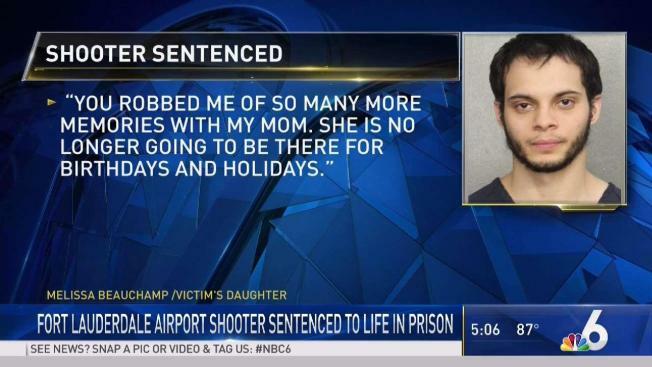 An Alaska man will be spending the rest of his life in prison for the January 2017 Fort Lauderdale airport shooting that left five people dead and six wounded. A sentencing hearing was held Friday for 28-year-old Esteban Santiago, who pleaded guilty in May to 11 charges in a plea deal in which prosecutors agreed not to seek the death penalty. At the hearing, U.S. District Judge Beth Bloom accepted the agreement, which calls for a life prison sentence plus 120 years. She described the incident as "85 seconds of evil." Several relatives of the victims delivered statements to the judge at the hearing. Santiago chose not to speak. "You robbed me of so many more memories with my mom," said Melissa Beauchamp, whose mother, Mary Louise Amzibel, was killed in the shooting. "She is no longer going to be there for birthdays and holidays." Beauchamp's father, Ed, was also wounded in the shooting and still suffers. "While nothing can ever heal the wounds inflicted by the defendant’s unspeakable and horrific acts of violence, we hope that the life sentence imposed today provides at least some sense of justice for the victims and their loved ones," U.S. Attorney Benjamin G. Greenberg said in a statement. "My thoughts are with the victims, their loved ones and everyone affected by this senseless and cowardly act of violence," Robert F. Lasky, Special Agent in Charge, FBI Miami, said in a statement. "While this sentence cannot erase what happened, may it serve to demonstrate society’s commitment to honor and remember those who suffered that day."